Barnes Wild Bluff Oysters are available in season from our onsite retail shop. 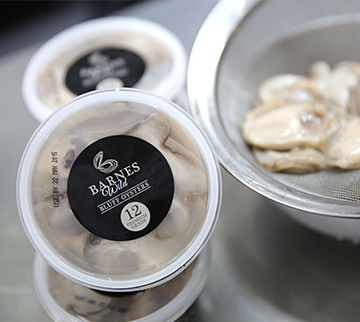 You can also ask for Barnes Oysters by name at great seafood retail outlets across the country such as restaurants, supermarkets, delis and takeaway stores. Please phone us to find a distributor in your area. Courier and packaging charges apply. Keep product refrigerated, all pots are clearly labelled with use by dates. 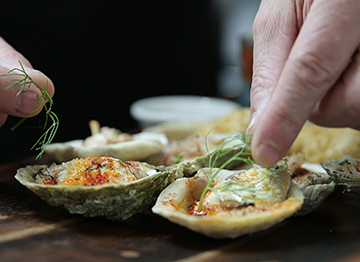 Weather conditions and quota regulations play a huge part in the availability of our oysters, making them even more treasured by those lucky enough to have them in season. Our season runs from 1 March to 31 August, during which time we work day and night to bring you the freshest and finest Barnes Wild Bluff Oysters. Please remember, stocks are often limited by weather conditions and quota regulations.